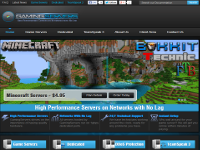 GamingServers Pty Ltd provides premium game server hosting of popular games such as Minecraft, Garry’s Mod, Terraria, and much more! We host and support over 100 games and mods, our 24/7 staff support and knowledge is unrivaled. If you are looking for a host that only uses high performance servers on networks with no lag then make sure to check us out. Use the coupon code 10%GSPCoupon to gain 10% off any game server or teamspeak 3 hosting, please leave a review below we appreciate all your feedback. Our dedicated servers are hosted in United States. Our administrative headquarter is located in Queensland, Australia. Good hardware, not had any issues with speed or ridiculous ping, but their customer service is absolutely horrid in every way. We would have to constantly wait days upon days to get a response to any question or ticket sent in. What was really the last straw with these guys is we had some sort of unknown issue with the game server control panel licensing, which they begun to work on.. only to accidentally delete every single file inside the server. They then continued to tell me they could retrieve them through a deep scan, but I made the mistake in believing them. They successfully retrieved every file EXCEPT the critical files that the in-game world was built on, effectively destroying ~1 year of work by tens of players in-game. All and all, do NOT recommend. Software is glitchy, and they seem to have zero idea of what they’re actually doing. Hey guys before they do anything GET A SERVER FROM THEM! I have recently bought a Garry’s Mod server from them and it is wonderful! It runs fast has great ping ALL the time. It is also cheap and has GREAT support i recently had some troubles with some files and Shane Waaka helped me and it was great. He helped me as soon as i said what i needed We speed through it well he i didnt do anything! they did it for me i was so greatful they even got me a type of FastDL For free and really fast!So before anything happens buy a server or two I know that I will be getting more! Great host, I highly recommend using this. There are many different kinds of servers to choose from. They have excellent support. Any questions you have, they are there to help. Take a look and give it a shot!